I remember my first trip to England somewhere around 1990 or so. I headed directly south to Hastings, for I had been studying about the great event and wanted to see the battlefield for myself. Of course, travel itineraries were much harder to plan in those days, but I saw no reason to doubt that I would find what I was looking for as long as I had a good map. Well, I was certainly in for a surprise! As I recall, Hastings was a sleepy little city. 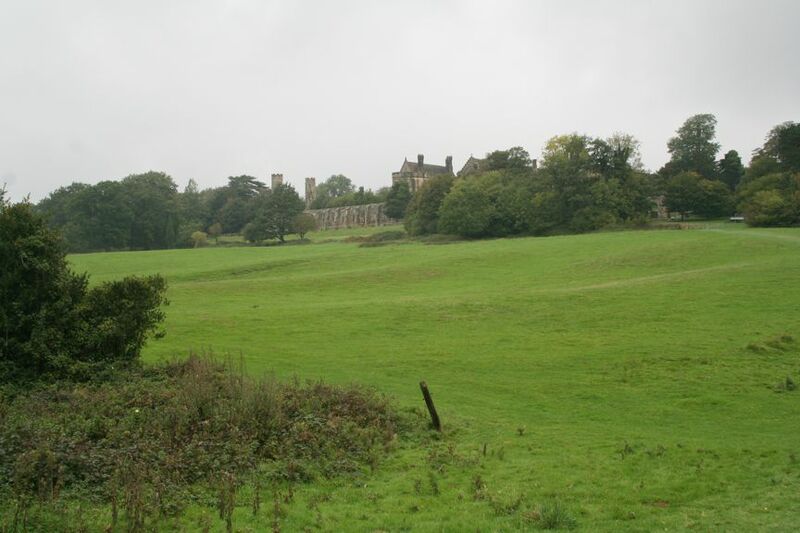 Yes, there is a castle ruins there, but no battlefield. As I was soon to discover, much to my embarrassment, the battle was fought about 7 miles north of Hastings at a place called Battle (no wonder!). Nor did William the Conqueror land at Hastings; his ships touched land about 10 miles to the west at a spot known to history as Pevensey and to locals as Normans Bay (there’s even a train stop). William had quickly assembled a great fleet, since he only started planning the invasion that very year. Mostly built for transport (unlike the great warships of the Vikings), they were single masted open boats with a sail and many were attached to smaller boats. Wace numbers the fleet at 696, though others state he brought over 3000; the larger number possibly included all sized crafts. Sir Charles Oman estimated that the Norman force numbered 12,000-14,000, though others estimated as many as 60,000. It’s probably safer to stay with the lower number, considering the size of the battlefield. William had planned to invade England months earlier; in August of that year, the Norman ships had gathered at the mouth of the river Dive. If he had succeeded in crossing the Channel when he wanted to, Harold would have been on hand to contest his landing, for the King was diligently guarding the southern coast with his Saxon levies. 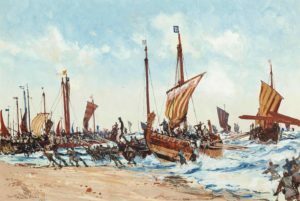 But the winds were against the invaders and William was delayed a month at Dive, then after an aborted attempt to cross, he spent another couple of weeks up the coast at Saint Valery. 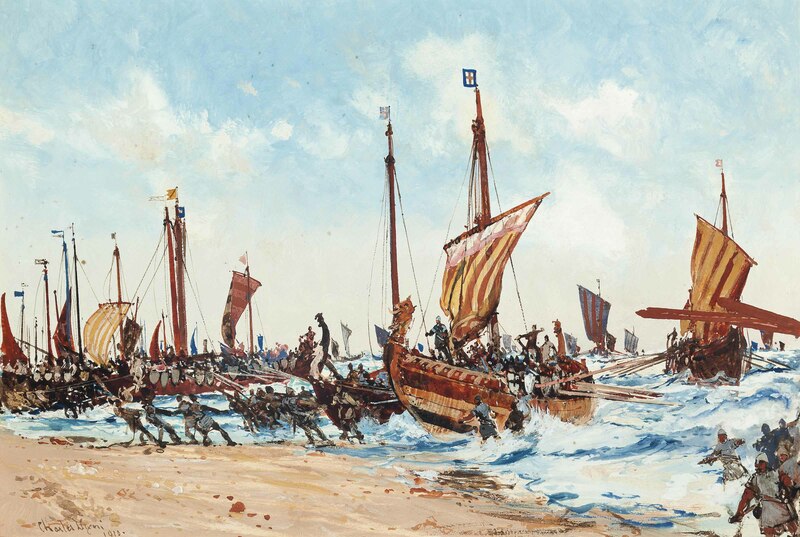 Finally, on the 27th of September, the winds changed and the Normans raced to their ships, although it took all day to load supplies and horses. Edward A. Freeman paints a picture of celebration while they were preparing: “The ships resounded with music; the pipe, the zittern, the drum, the cymbals, all were heard, and the voice of the trumpet sounded proudly over all.” (Vol. 3, p. 399). When William boarded it was already dark, so he ordered all the ships to put a light on their mast and he placed a huge lantern atop his own Mora to be the guiding star of the fleet. William’s luck was with them. Not only was the crossing almost without incident (two ships were lost, including one that carried a soothsayer who prophesied that England would fall without a blow), they were astounded to discover the long beach deserted. No Saxon host stood ready to repel the invaders because unbeknownst to William, King Harold had hastened north to defend his country against a totally different threat: the Norwegian King Harald Hardraada. Duke William was the first warrior to set foot on land — though his foot slipped out from under him and he fell forward on both hands. Horrors! A loud cry went up around him, for his men saw this accident as a terrible omen. But William kept his wits about him. Grabbing two fistfuls of sand, he cried out, “By the splendor of God I have taken seizen of my kingdom; the earth of England is in my two hands,” thus transforming bad luck into good fortune and saving the day. Encouraged, the Normans disembarked in good order, still expecting resistance from the English. But none was forthcoming and the invaders most likely drew their ships onto the beach. It is thought a small garrison was left to guard the ships, utilizing the ruins of a Roman fort on the site. It is possible that the Normans build one of their portable wooden fortresses there, but this is debated. They did not bring many provisions with them, and Pevensey was not the ideal site for foraging. The Normans probably only spent one day there before moving their force east to Hastings, which was set as William’s permanent camp. They dug a trench, formed an earthen mound and erected a wooden fortress at their new location. It was now September 29 and William had plenty of time to set about terrorizing the locals in earnest so as to draw King Harold back to meet him in fateful battle. I’ve seen estimates as low as 7000 for William’s army at the battle, but if Eozen’s Bretons were 5000 men (4000 professionals plus 1000 levied), as one site claims, and comprised over 1/3 of the total army, as I’ve read elsewhere, then a number between 12,000 and 14,000 seems about right. Speaking of Normans and Bretons, one of William’s contemporaries was named “Norman the Breton”. I find this doubly amusing because there’s an Australian retail homeware chain called “Harvey-Norman” after its founders’ surnames. A possible meaning I’ve read of for “Mora” is “Sea” in one of the dialects of the time. So I wonder whether it was a reference to Armorica (Gaulish “Are-Mor-ika”, “Place By the Sea”), the ancient kingdom of which Brittany, Normandy, Anjou, Maine, Touraine and Blois were regions? Thank you for that link: it’s the sort of multiple allusion that would have appealed to many of the participants in the venture. Elisabeth’s emphasis is naturally on William and Matilda, but since Queen Emma was maternal aunt to Alan’s father Eozen the symbolism must have been similarly meaningful to him.